We are excited to present a new regular column in Wood News Online: “Tips From Sticks-In-The-Mud Woodshop”. 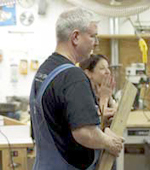 Jim Randolph is a hobbyist, not a professional – someone who loves woodworking, just like you do. He has found a few better ways to accomplish some tasks in the workshop and he’ll be sharing them with you each month in his column. CLICK HERE to take a look at the very first column of Tips from Sticks-In-The-Mud Woodshop. CLICK HERE to read the rest of the March issue of Wood News Online.